The Wiki is a collaboration tool that allows multiple users to read, edit and modify content added in a wiki page by the instructor or a fellow student. Click Create Wiki Page on the action bar, while on the wiki topic page. Type a name for the page. Type information in the Content text box. On the wiki listing page, roll over the wiki page you wish to edit and click the arrow next to its name. Make the changes that you want and then click Submit. While on the Wiki listing page, select a wiki title. Select the Wiki page that you would like to add the link. On the Edit Wiki Page and within the content editor select the word that you wish to add the link to another wiki page. 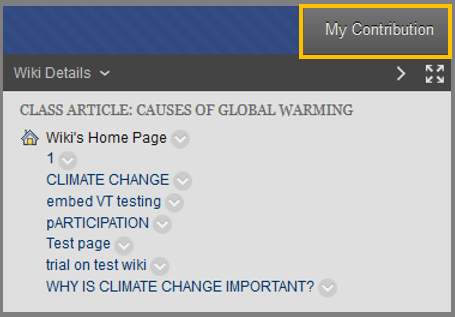 Click the Link to Wiki page button in the third row of tools of the content editor. This function is disabled if only one page exists, as there is no other page to link to. In the Insert Wiki Page Link pop-up window that will appear, select the wiki page that the previously selected word will lead to. On the Edit Wiki Page , click Submit again. On the Wiki Listing Page, select a wiki title. Select the Wiki page that you want to comment. Select a Wiki title from the Wikis listing page. Click My Contribution and view all relevant information about your contributions.